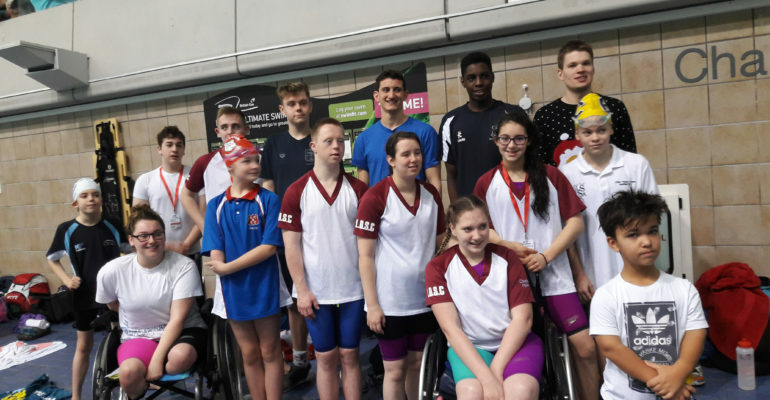 Seventeen London Disability Classified Swimmers travelled to Manchester to compete in this prestigious annual event, supported by Michelle, Head Coach and Nick, Team Manager. Saturday morning opened with a heroes parade and celebration of GB Rio Paralympians including of course GSF ambassador and London Disability Swimming Club’s (LDSC) Amy Marren. So to the first event, the 100m freestyle in which there were 150+ male entries and 91 female entries . There were some really strong swims from our LDSC individuals. Notable, were the PBs from Sebastian, Balthazar, Ben, Josh, Leah and Charlie. We then swiftly moved onto the 100m breaststroke – Our swimmers stepping up on the blocks to give their best for their individual swims. Matthew achieved a two second PB and silver and Seb a massive 9 second PB, Billy swam outside his entry time finishing 12th overall in his age and classification. Leah, Charlie and Sarah also swam in this event, Charlie reaching 4th in his respective age groups. The afternoon started with the 50m Freestyle with the following results once age group/classifications were calculated; Seb (PB with bronze), Balthazar (Bronze & a PB), Matthew (5th), Ben (6th), Aaron (4th), Daisi (Gold), Ben (6th), Josh (Silver), Billy (11th), Chloe (5th), Charlie (2nd & Silver), Leah (Bronze), Haddie (6th), Amy (Gold ), Sarah (4th). We then moved to the 200 IM, from LDSC 6 male swimmers and 4 female competed with strong swims. Our second morning brought just as much enthusiasm, all swimmers arriving on time to meet their coaches for warm up at 07:30am. The first events of the morning were launched with the 100m Backstroke, 11 male heats followed by 9 female. LDSC results were Seb with a massive 5 second PB; Matthew, Leo, Daisi, Billy and Ben swam just outside their entry times; Balthazar gained a further PB swimming a second faster. Charlie, Leah and Chloe all swam PB’s, Sarah was just outside hers. Moving onto the 100m Butterfly our swimmers were Balthazar, Billy, Josh, Aaron, Daisi and Amy. This was followed by the 400 metres Freestyle in which we had 8 swimmers. The Medal Tally at the end of the 2 days was an amazing 44. Multiple personal bests were achieved by many swimmers part of LDSC. The GLL Sport Foundation is proud to support the club and their amazing achievements from this weekend. To conclude, LDSC had a very successful weekend, achieving a total of 44 medals. 2016 has been a great year for the club, and the GLL Sport Foundation will be supporting them through 2017 to hopefully better their achievements from this year.